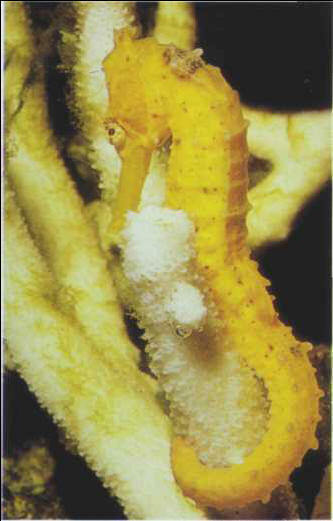 The yellow seahorse is, as its name suggests, usually yellow, but its coloring gets darker in poor environmental conditions. It stays in a vertical position, with its tail serving to cling on to the decor (which must be free of Coelenterates). In captivity, it feeds on brine shrimps or other small, live prey. Reproduction may be possible in captivity: the male incubates the eggs in its ventral pocket. Size: 15 cm. УГАРИТ , город-государство 2-го тыс. до н. э. в Финикии, см. Рас-Шамра.